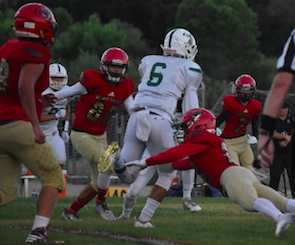 CORONADO — It was a battle from the beginning to the end but the final score read: Coronado 21, Mountain Empire 14. 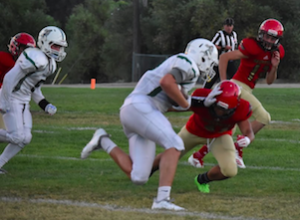 Coronado began a good drive where they converted a couple first downs but the threat was halted by an interception by sophomore Marcus Smith that he returned for a 68-yard touchdown, although Mountain Empire missed the extra point. 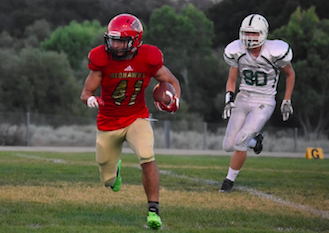 Coronado scored on the next series and eventually built a 14-6 halftime lead. The RedHawks received the ball after the half and proceeded to go on a time-consuming drive that culminated in a 31-yard TD pass from Gabe Hydorn to Smith. A couple of series later, Coronado scored and took a 21-14 lead in the fourth quarter. Later in that quarter, Coronado was trying to put the game away but were stopped on fourth down by the RedHawks. With a little over three minutes left, MEHS took over the ball deep in their own territory. The RedHawks drove the ball down to the red zone with less than two minutes to go, but a couple of mental errors put them in a bad spot. There was a false start penalty and also a fumble that was recovered by the RedHawks to keep the ball. On fourth down from the Islanders’ 29, Gabe Hydorn dropped back and threw a deep pass to Marcus Smith on the left side that landed incomplete in the end zone. Next week, MEHS has a bye.